Skoda has launched a new flagship variant of the Kodiaq, the Laurin & Klement. Priced at Rs 35.99 lakh (ex-showroom India), the new variant is priced at a premium of Rs 2.16 lakh over the Kodiaq Style. For this premium, you get features like Virtual Cockpit all-digital instrument cluster, aluminium pedals, Laurin & Klement badging, stitched Laurin & Klement logo on the front and rear seat backrest, 360áµ surrounding area view, nine airbags (dual front, side airbags at front and rear, curtain airbags at front and rear, and driver knee airbag) and textile floor mat. On the outside, you get a few more Laurin & Klement badges along with chrome elements on the grille, chrome highlights on the rear diffuser, silver roof rails and protective elements on the front bumper. Earlier, the Kodiaq'sgo-faster cousin, the Kodiaq RS had set a lap record at the fabled Nurburgring. With a lap time of just under 9 minutes 30 seconds, it has become the fastest seven-seater SUV to go around the Green Hell. The RS is powered by Volkswagen group's 2.0-litre BiTDi engine that develops a whopping 239PS of power and 500Nm of torque. That's a nearly 100PS and 150Nm more compared to the Kodiaq we get here in India. The prices of Kodiaq diesel variants start at Rs. 35.37 lakh and the top-end diesel is priced at Rs. 36.79 lakh. Skoda Kodiaq is available in 3 variants and 4 colours. Share your experiences with Kodiaq? The claimed ARAI mileage for the Skoda Kodiaq diesel is 16 kmpl. Q. I am not able to decide which vehicle 1. 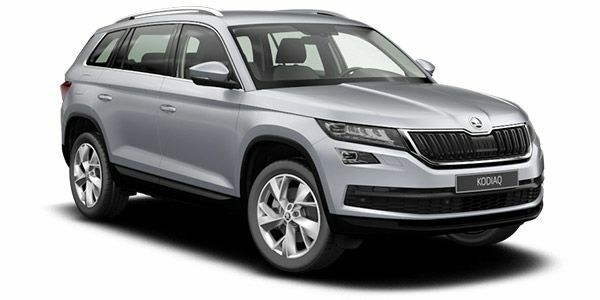 Skoda Kodiaq 2. Toyota Fortuner AT 3. Ford Endeavour can you please help? Q. Which is better Skoda Kodiaq or Toyota Fortuner? In comfort skoda kodiaq is better but in off-road ability toyota fortuner is good.. In the centre console of the car, only two rear a/c vents are available. Q. Toyota fortuner or Skoda Kodiaq which one to buy please suggest? Q. How does the Kodiaq compare with the Innova automatic, particularly the leg space and cabin space? Does the new Laurin & Klement variant make the Skoda Kodiaq a worthy alternative to similarly priced SUVs with more influential badges? Does the Skoda Kodiaq deliver on its promise of being a proper 7-seater SUV? Does the Skoda Kodiaq have what it takes to draw you away from traditional burly, ladder-frame 7-seaters? Priced at Rs 34.5 lakh (ex-showroom, Delhi) Skoda Kodiaq is a full-fledged 7-seater SUV available in the single Style variant in Indian market. The Kodiaq comes with the sophisticated car-like interiors married with a butch and rugged stance of an SUV. The nose of the Kodiaq is typically Skoda and thanks to the long wheelbase, the overall turn out commands the attention. Skoda has equipped Kodiaq with all the bells and whistles including nine airbags, cruise control, reverse parking system, sunroof, three-zone automatic climate control, 8.0-inch touchscreen infotainment system, 630-litre of boot space, and large 63-litre fuel tank. Under the Hood, Skoda Kodiaq is powered by 2.0-liter turbocharged diesel engine maximum power of 148 BHP, mated to 7-speed DSG automatic transmission sending power via all-wheel drive system. In Indian market, the Skoda Kodiaq is up against the likes of Volkswagen Tiguan, Hyundai Tucson, Toyota Fortuner, and Ford Endeavour among others.